During one of my chats with my mother in law over the phone we were discussing all the ways that sesame could be used in every day cooking when she quickly gave me two ways.One as a sweet sesame rice that I haven't yet tried and the other a savory sesame rice that I give below.I went with my gut for the quantities of each of the ingredients(since she had just given me the ingredients) and was very happy with the results of this experiment.This simple,quick and tasty dish was a very nice change from the usual types of rice dishes we make and can be served with the traditional kootu to make a complete meal. Ingredients and method to make the savory sesame rice. Dry roast coriander seeds,sesame seeds, fenugreek seeds and dry red chillies separately until each of them turns browner (in case of red chillies dark red) and keep aside. In a large pan heat oil and add mustard seeds and split black gram lentil. When the mustard seeds splutter and the lentil starts turning reddish,add asafoetida to it. Lower the heat and add the cooked rice and salt to taste. Finally add the ground powder and mix well. Serve hot with curry of choice,salad of choice or just plain yogurt and papads. In case you are making this with white rice, reduce the amount of red chillies since white rice will not absorb as much spice as brown rice. Also remember that the rice has to be cooked such that each grain is separate. sesame rice is indeed a nice change from the usual mixed rice varieties, good one. Usha, a couple of things... have you tried brown basmati rice? It is just amazing. If you have used it before you know what I am talking about. Seems like it would go nicely for the sesame rice. And for heaven's sake dont watch that movie... LOL. Sesame rice is something different from usual rice varieties looks very very tasty and its new to me...WILL TRY IT DEFINITELY. Delicious dish... My mom makes this during navrathri. Cant wait to see the sweet version. Your rice looks very nice!! Thanks for reminding me of sesame rice.. totally forgot about it.. i love it and am going to make it sometime soon! my mom used to make this..i tried,never came that good..thanks for sharing..will try your way!! I never made it or what never even thought, only one thing is it little bitter taste? But i love sesame, that I should try out soon Usha! Thanx for sharing! hey a new recipe for me! Delicious dish..My husband's favorite Rice..But I never tried in brown basmathi rice.nice recipe!!! Never tried this. Completely new to me. Will try this sometime. Wow.. thxs for remindind me.. i am also totally forgot about it.. thxs for sharing.. The masala mix sounds really tempting :-) I've only tried sesame rice with loads of fresh roasted whole seeds thrown in. this sounds much more interesting. It took a few tries, but the pizza dough was well worth it! It might sound complicated, but it’s not too big a deal; especially when compared to making something like…say, the Parotta from S. India! Sesame rice sounds like a great way to include more fiber in the diet-great idea! I'm not a big fan of ellu podi that is mixed with rice but this looks delicious. I'm just like you, I visit my own blog for previous recipes because I have forgotten the exact measurements! :) LOL! 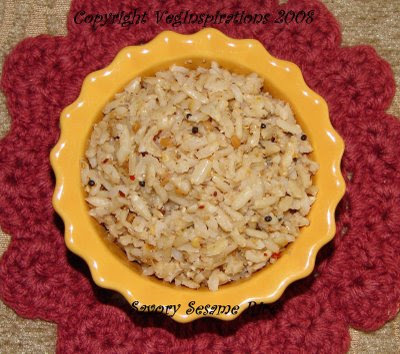 This sesame rice sounds yummy and flavorful! Using Brown rice is healthy too! Never tried this usha.....sounds gr8.. I love sesame rice and urs looks very tempting!! tempting dish... havent tried this before shall give it a try. never had sesame rice, this is a nice dish. will try it soon.